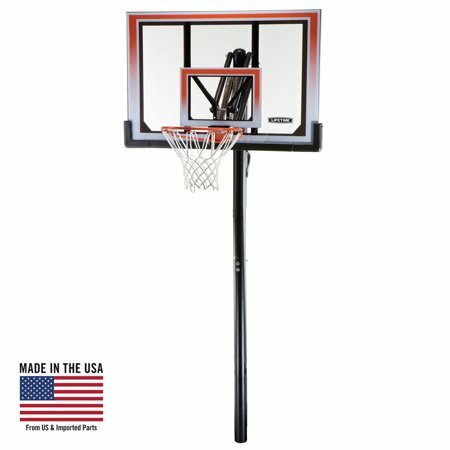 Basketball Hoop Installation is available for $479.00, available at checkout. Lifetime In-Ground Basketball System - Features a clear, 50 in. x 33 in. x 1 in. Steel-Framed Shatterproof Backboard with a blow-molded frame pad (black), Action Grip, 3.5 in. round pole - 3 piece (black), and a Slam-It&reg; Rim (orange). proposition 65 reasons:This product can expose you to chemicals including Nickel (Metallic), which is known to the State of California to cause: cancer. I bought this goal several years ago and it is exactly what my boys needed. We moved and it was easy to get new poles and new hardware to install the goal at the new house. Overall, I was very pleased with this basketball sustem. I bought it for my son's eleventh birthday. I was worried after seeing some of the other reviews about setting it up and installing the in ground system. We bought the in ground sleeve (which I highly recommend) and used quick set cement (we had cement set for 24 hours before adding the final system to it). My husband did the in ground sleeve, cement, and was able to put everything together on his own within a few hours (with the exception of a trip to the hardware store to get the correct size bolt for one spot...the wrong size came with it). The only help he received from another person was actually lifting the final product onto the group sleeve pole, and it all went smoothly. We bought it three weeks ago and have been using it nonstop. It's also super easy to change the height...even my younger child can do it. Great value for a great system...very pleased! This is perfect for our family! It is nice and sturdy, some what easy to assemble. Directions can be slightly confusing. Couple of the bolts look like they are wrong size but weren't. But overall excellent hoop! We plan to put an outdoor court up soon around it! I bought this 1 month ago and it's great! Had some fitment issues, they sent new parts no question.